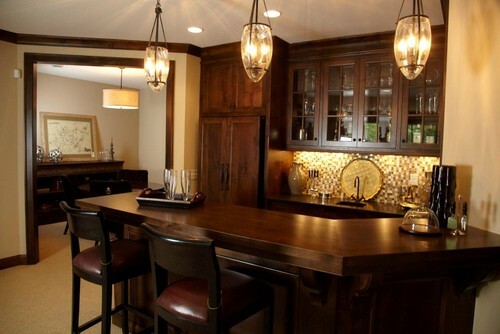 To finish up our series on basement lighting, here are a few images from Houzz.com – and excellent resource for all your design needs. In the pictures below, you will see examples of creative ways to use lighting in your basement to accomplish specific goals. You want to highlight a certain section of the room? Great! Install track lighting or individual canned lights that are tilted towards the space you want to highlight. You want to make the room appear larger? Great! Purchase a few lamps or hanging light fixtures that send light upward towards the ceiling. You want to create an intimate environment? Great! Lamps or fixtures with soft shades or canned lights with dimmers will do that for you. So can lights places under shelves or cupboards. And don’t forget lighting for your stairway! 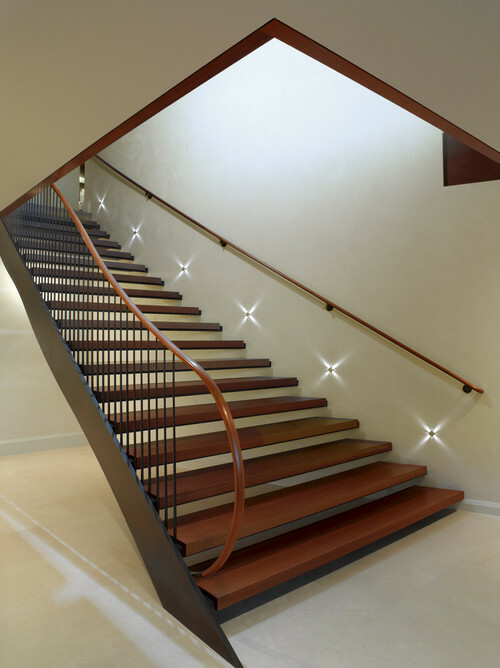 Stairway lighting adds to a calm ambiance while also protecting against falls during the night. Like the designers of the space below, you can get really creative. Whatever your design goal is, lighting will undoubtedly play a role. So, browse the posts from this last series and get on the path to making your basement beautiful.